Carpenter bees (the genus Xylocopa in the subfamily Xylocopinae) are large bees distributed worldwide. Some 500 species of carpenter bees are in the 31 subgenera. Their common name is because nearly all species build their nests in burrows in dead wood, bamboo, or structural timbers (except those in the subgenus Proxylocopa, which nest in the ground). Carpenter bees are traditionally considered solitary bees, though some species have simple social nests in which mothers and daughters may cohabit. However, even solitary species tend to be gregarious, and often several nest near each other. When females cohabit, a division of labor between them occurs sometimes, where one female may spend most of her time as a guard within the nest, motionless and near the entrance, while another female spends most of her time foraging for provisions. For scores of wild bee species, females and males visit very different flowers for food — a discovery that could be important for conservation efforts, according to Rutgers-led research. Indeed, the diets of female and male bees of the same species could be as different as the diets of different bee species, according to a study in the journal PLOS ONE. “As we get a better sense of what makes flowers attractive to different kinds of bees, maybe we can get smarter about bee conservation,” said lead author Michael Roswell, a doctoral student in the lab of senior author Rachael Winfree, a professor in the Department of Ecology, Evolution, and Natural Resources at Rutgers University-New Brunswick. Five years ago, when Winfree Lab members were evaluating federally funded programs to create habitat for pollinators, Roswell noticed that some flowers were very popular with male bees and others with females. That spurred a study to test, for as many wild bee species as possible, whether males and females visit different kinds of flowers. New Jersey is home to about 400 species of wild bees — not including Apis mellifera Linnaeus, the domesticated western honeybee whose males do not forage for food, Roswell noted. The scientists collected 18,698 bees from 152 species in New Jersey. The bees visited 109 flower species in six semi-natural meadows with highly abundant and diverse flowers. The meadows were managed to promote mostly native flowers that attract pollinators. Female bees build, maintain, collect food for and defend nests, while male bees primarily seek mates. Both sexes drink floral nectar for food, but only females collect pollen that serves as food for young bees, so they forage at greater rates than males. From the flowers’ standpoint, both female and male bees are important pollinators — though female bees are more prolific because they spend more time foraging at flowers. Before mating, the males of some species travel from the area where they were born. Targeting their preferences for flowers may help maintain genetically diverse bee populations, Roswell speculated. Activists dressed as bees vandalised Bayer’s Paris headquarters on Thursday, during a protest against the corporation’s environmental impact and use of pesticides. The protesters used fire extinguishers to spray yellow paint on the windows at the entrance of the building, and then poured a sticky liquid outside the front door, in what Association for the Taxation of Financial Transactions and for Citizens’ Action (ATTAC) spokesperson Annick Coupe called a symbolic gesture. “You see bees, symbolically, came to tell Bayer that it’s killing them. And so they poured honey, always symbolically, and also poured a sticky product on the ground and brought it back to Bayer,” she said. The international pharmaceutical corporation came under fire in 2016 after a study they conducted jointly with agricultural company Syngenta revealed their pesticide products caused severe harm to honeybees. The results of the survey were first left unpublished, until environmental group Greenpeace gained access to the study through freedom of information laws. When scientists blamed neonicotinoid pesticides produced by corporations like Bayer/Monsanto for massive dying of bees, sometimes the reaction was: Neonics do not kill bees. Varroa mites do. However, in 2015 there already was this study: Interaction between Varroa destructor and [Bayer‘s] imidacloprid [pesticide] reduces flight capacity of honeybees. A University of Guelph study is the first to uncover the impact of neonicotinoid pesticides on honey bees‘ ability to groom and rid themselves of deadly mites. The research comes as Health Canada places new limits on the use of three key neonicotinoids while it decides whether to impose a full phase-out of the chemicals. Published in the Nature journal Scientific Reports, the study revealed that when honey bees are infected with varroa mites and then regularly exposed to low doses of a commonly used neonicotinoid called clothianidin, their self-grooming behaviour drops off. Without that self-grooming, bees are susceptible to mites that can also carry viruses that can quickly kill, said lead author Nuria Morfin Ramirez, who completed the research along with Prof. Ernesto Guzman, School of Environmental Sciences, as part of her PhD. “When bee colonies began to collapse years ago, it became clear there wasn’t just one factor involved, so we were interested in whether there was an interaction between two of the main stressors that affect bees: varroa mites and a neurotoxic insecticide, clothianidin,” said Morfin. Neonicotinoids, or “neonics,” are the most commonly used insecticides in Canada. They are coated on canola and corn seeds or sprayed on fruit and vegetable plants and trees. But they have also been linked to honey bee colony collapses. Varroa mites are also contributing to colony collapses and have been associated with more than 85 per cent of colony losses. The mites kill bees by slowly feeding off their body fat and hemolymph (blood), and can also transmit a virus called deformed wing virus (DWV). One of the only ways bees can protect themselves is to groom aggressively and brush the mites off. The researchers wanted to know whether the two stressors of pesticide exposure varroa mites were working together to contribute to bee deaths. The research team used bees from U of G’s Honey Bee Research Centre and exposed them to a widely used neonic clothianidin, either on its own or along with varroa mites. They experimented with three doses of clothianidin, all similar to what the bees would experience while feeding on flower nectar of neonic-treated crop fields, but all low enough to be considered sublethal. “What we found was a complicated interaction between the mite and the pesticide that decreased the proportion of bees that groomed intensively, and affected genes associated with neurodegenerative processes,” Morfin said. Bees exposed to medium level doses of the neonic showed no changes in grooming behaviour, but when they were also introduced to varroa mites, the proportion of bees that groomed intensively was 1.4 times lower compared to the bees exposed to clothianidin alone. When exposed to the lowest dose of the pesticide, the proportion of bees that groomed significantly dropped. The lowest dose was also linked to an increased level of deformed wing virus — an effect not seen at the higher doses. Summary: An ancient and rare beetle fossil is the oldest example of a social relationship between two animal species. A paper describing the work appears on April 16 in the journal eLife. Symbiotic relationships between two species have arisen repeatedly during animal evolution. These relationships range from mutually beneficial associations, like humans and their pet dogs, to the parasitic, like a tapeworm and its host. Some of the most complex examples of behavioral symbiosis occur between ants and other types of small insects called myrmecophiles — meaning “ant lovers.” Thanks to ants’ abilities to form complex social colonies, they are able to repel predators and amass food resources, making ant nests a highly desirable habitat. Myrmecophiles display elaborate social behaviors and chemical adaptations to deceive ants and live among them, reaping the benefits of a safe environment and plentiful food. Ants’ social behaviors first appear in the fossil record 99 million years ago, during the Cretaceous period of the Mesozoic era, and are believed to have evolved not long before, in the Early Cretaceous. Now, the discovery of a Cretaceous myrmecophile fossil implies that the freeloading insects were already taking advantage of ants’ earliest societies. The finding means that myrmecophiles have been a constant presence among ant colonies from their earliest origins and that this socially parasitic lifestyle can persist over vast expanses of evolutionary time. The fossilized beetle, named Promyrmister kistneri, belongs to a subfamily of “clown” beetles (Haeteriinae), all modern species of which are myrmecophiles. These modern beetles are so specialized for life among ants that they will die without their ant hosts and have evolved extreme adaptations for infiltrating colonies. The beetles are physically well protected by a thick tank-like body plan and robust appendages, and they can mimic their host ants’ nest pheromones, allowing them to disguise themselves in the colony. They also secrete compounds that are thought to be pacifying or attractive to ants, helping the beetles gain the acceptance of their aggressive hosts. The fossilized Promyrmister is a similarly sturdy insect, with thick legs, a shielded head, and glandular orifices that the researchers theorize exuded chemicals to appease its primitive ant hosts. Depending on another species so heavily for survival has its risks; indeed, an extinction of the host species would be catastrophic for the symbiont. The similarities between the fossilized beetle and its modern relatives suggest that the particular adaptations of myrmecophile clown beetles first evolved inside colonies of early “stem group” ants, which are long extinct. Due to Promyrmister’s remarkable similarity to modern clown beetles, Parker and his collaborators infer that the beetles must have “host switched” to colonies of modern ants to avoid undergoing extinction themselves. This adaptability of symbiotic organisms to move between partner species during evolution may be essential for the long-term stability of these intricate interspecies relationships. Notre Dame has housed three beehives on the first floor on a roof over the sacristy, just beneath the rose window, since 2013. Each hive has about 60,000 bees. Geant said the hives were not touched by the blaze because they are located about 30 meters below the main roof where the fire spread. 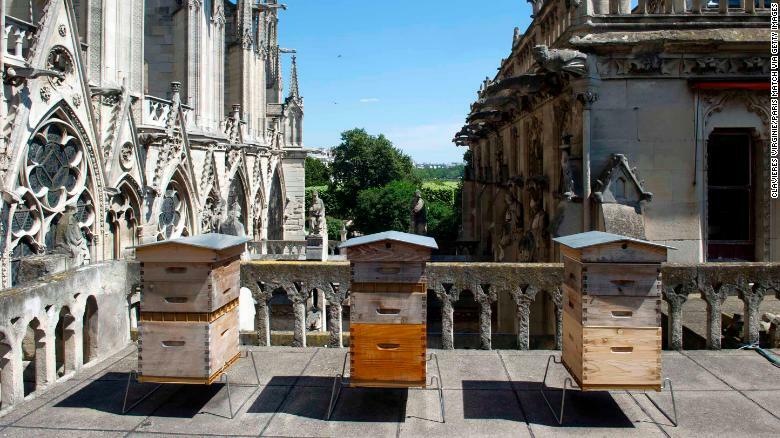 The bee colony that lives on the roof of Notre Dame also survived the fire. There was still uncertainty about this, but the three hives, in which 180,000 honey bees live, were not affected by the fire. The hives were placed on the roof in 2013 as a contribution to biodiversity in the center of Paris. They stood about 30 meters below the tip of the roof that burned down. According to the beekeeper of Notre Dame, bees can survive a fire by filling themselves with honey as soon as they detect a fire. Insects have no lungs and cannot choke because of smoke. European bees will never leave their hive and will protect their queen at all times, beekeeper Geant says. These giant bees buzzing create spectacular waves. This 16 April 2019 shows a toad eating an earthworm. It is not easy; the toad has to use even its eyes for it. Nathan Schrijver made this video in Utrecht province in the Netherlands.